Ruby was until recently Chief Executive of Mitie, having been appointed in 2007. She is one of a small number of women to have held the position of Chief Executive in a FTSE 250 or FTSE 100 and was the first Asian woman to be appointed in such a role within that group of companies. 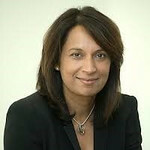 She joined Mitie in 2002 as the Group Financial Director and became its Chief Operating Officer in 2005. Ruby studied Economics at Kingston University and qualified as an accountant, training at BDO Stoy Hayward. Women's Business Council: Chair, 2012-2014. In 2011 Ruby was given an Honorary Doctorate by Kingston University in recognition of her achievements as CEO of a FTSE-250 company and within the business community and an Honorary Degree by the University of the West of England in recognition of her significant national and local contribution to business. In 2012 Ruby was awarded a CBE in the New Year Honours for services to business and diversity in business. In 2015 Ruby was awarded an Honorary Doctorate by Cranfield University for services to the energy industry. Ruby is married with two children.